The child welfare agency will notify the Mexican consulate of child protective services cases in which children or parents are Mexican nationals. The child welfare agency will ensure access to the child by a consular representative; several particularly mention that access includes attendance at juvenile dependency court hearings. The Mexican consulate will facilitate requests for home evaluations of potenial placement options in Mexico (through the Mexcian national social services agency DIF, the Sistema para el Desarrollo Integral de la Familia). The Mexican consulate and its representatives understand and agree to abide by confidentiality rules applicable to child welfare cases. 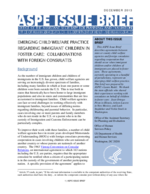 For children born in Mexico, the child welfare caseworker may request from the Mexican consulate a certified copy of the child's birth certificate. If the child appears to qualify, the Mexican consulate will assist in acquiring necessary documentation for obtaining Special Immigrant Juvenile Status. Provides a form or list of information to be provided in consular notifications. The child welfare agency will determine whether children taken into custody have Mexican lineage. The child welfare agency will inform Mexican children of their right to contact the consulate and will inform the consulate without delay if a child requests such contact. The child welfare agency will ensure consideration of family placements in Mexico. The Mexican consulate will facilitate requests for placement supervision by the Mexican national social services agency DIF (e.g. the preparation of monitoring reports on the child). The Mexican consulate may assist in securing the testimony of relevant witnesses in Mexico. The Mexican consulate and the Mexican national social services agency (DIF) will work together to provide services to parents or potential caretakers in Mexico in anticipation of possible placement. The Mexican consulate will assist in arranging and supervising visitation at border facilities. The Mexican consulate will collaborate on cases in which the parent(s) may have entered Mexico to evade a child protection investigation and will assist in protecting the child from risk. The Mexican consulate will inform the child welfare agency of any contact made with Mexican national involved in Juvenile Dependency Court proceedings. The Mexican consulate may assist a Mexican national in requesting legal representation in Juvenile Dependency Court proceedings. The child welfare caseworker may request from the Mexican consulate the names of appropriate agencies within the country that can assist with identifying relatives or other placement options and conducting necessary background checks and home studies. * The documents reviewed for Missouri and Washington were agencies’ policies on immigrant children rather than an MOU and dealt with children of all nationalities. Missouri's policy distinguishes between nations for which notification is and is not mandatory, which relates to whether the nation is among the signatories to the Vienna Convention on Consular Relations. In addition, Missouri's policy identifies issues regarding undocumented immigrants of which caseworkers should be aware. a = While the MOU itself does not contain such a provision, such assistance or services are provided and are covered in policy guidance and/or procedures developed to implement the MOU. New York has developed a guide to obtaining birth certificates and passports for immigrant children, including application requirements for 10 consulates. for several additional states and counties.